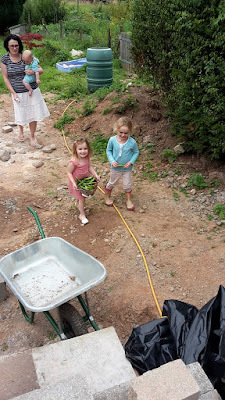 Although I've not been able to get into the garden as much as I would like lately I have been enjoying seeing the girls in the garden picking stuff for tea. Our back garden is like a building site at the moment, it'll look much better next year! 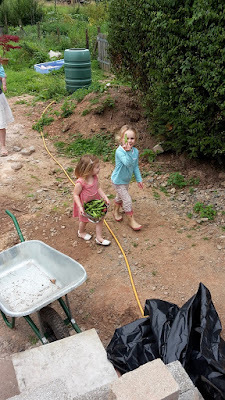 These are pictures from Monday when they went to pick the veg for a tea, My wife said she's not had to pod a single bean yet, they love sitting there and podding them all and then eating them a little while later once cooked. So proud of their pickings. 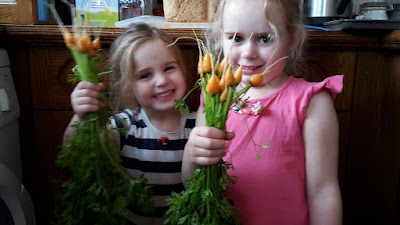 They did make me laugh last night when my wife had to do an extra vegetable with tea, because while she was picking some herbs they were pulling up carrots on their own! I love the fact they know which were carrots just by looking at their leaves (they're only two and four). My eldest was also making me proud the other night when we were at my brothers and she was naming all the herbs and strawberry plants on his patio. It's amazing how much they know already! Don't let these girls into your garden if you want any veggies left! They are great, can't beat drip drip education, a gentle soaking in of knowledge. Always a joy to see young ones OUTSIDE and enjoying the greatest pasttime on earth. You are doing such a great job getting them into the garden learning. You and your wife are giving your children an amazing upbringing. Fresh air, exercise, fresh healthy food and quality time together as a family. So many children are sat in front of a screen with unhealthy food whilst the parents are 'busy' looking at a screen themselves. A lot of children these days won't even eat vegetables let alone be able to name them. Keep on doing what you are doing as you are giving them all a fantastic childhood. They are truly lucky little girls, knowledge is always the key to a better life. Brilliant all round education. There are lots of children out there who don't know where food comes from. Some think there are animals named burgers!